The pressure to criticize, cynically mock and downplay anything President Donald Trump does is considerable these days. I, like many, many, Americans have decided to give the frustrated their space to vent, while I focus on bringing about positive change in the best way I can. Today, that means I want to praise President Trump for taking such a clear, strong stance in favor of religious freedom, by signing his religious liberty executive order today. It does not go unnoticed that he did so today, bringing renewed attention to our oft-forgotten National Day of Prayer, and that he commemorated it with a beautiful ceremony in the Rose Garden. 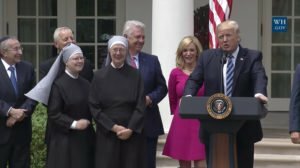 It was so refreshing to see the President of the United States acknowledging and boldly standing in support of the Little Sisters of the Poor, who had been so unjustly dragged into court, all the way to the Supreme Court, by the previous administration. The moment President Trump asked them to stand with him on stage was the highlight of the day. Some might dismiss that as insignificant. I choose not to do that. To me, it sends a clear message that will reverberate at every level of government and much of the culture. My daughters got to see that. Because of their age, they had never seen anything like it, all they know is President Obama. Faith is deeply imbedded into the history of our country. The spirit of our founding and the soul of our nation … Today my administration is leading by example, as we take historic steps to protect religious liberty in the United States of America. We will not allow people of faith to be targeted, bullied or silenced anymore. We need somebody who’s got the heart— the empathy – to recognize what it’s like to be a young teenage mom. The empathy to understand what it’s like to be poor or African American or gay or disabled or old — and that’s the criteria by which I’ll be selecting my judges. President Trump’s first selection to the Supreme Court, Neil Gorsuch, you may remember, is a champion of religious liberty with a proven track record of upholding the First Amendment right in cases like the Hobby Lobby v. Sebelius and Little Sisters v. Burwell. Today, President Trump said, “No American should be forced to choose between the dictates of the federal government and the tenets of their faith.” I am grateful for those words. Section 1. Policy. It shall be the policy of the executive branch to vigorously enforce Federal law’s robust protections for religious freedom. The Founders envisioned a Nation in which religious voices and views were integral to a vibrant public square, and in which religious people and institutions were free to practice their faith without fear of discrimination or retaliation by the Federal Government. For that reason, the United States Constitution enshrines and protects the fundamental right to religious liberty as Americans’ first freedom. Federal law protects the freedom of Americans and their organizations to exercise religion and participate fully in civic life without undue interference by the Federal Government. The executive branch will honor and enforce those protections. That is how bad the culture of the executive branch got under the Obama Administration. President Trump’s clear policy directive will go a long way to correcting some of these abuses. He can show, not only that these abuses were wrong, but that they were simply unnecessary, and no president should benefit from such illegitimate tactics. This is the part that aims at the “Johnson Amendment” which generally prohibits non-profit organizations from endorsing or opposing political candidates. Like, with the IRS problem, the issue in this area, more than the law itself, is the abuse and misuse of that law to intimidate churches and pastors. In the same way, President Trump’s simple effort to make clear where his Administration’s pressure points lie can have a significant positive effect on religious liberty. More needs to be done, no doubt, but the truth is that even though the First Amendment should be enough, these small administrative changes can have considerable impact. Sec. 3. Conscience Protections with Respect to Preventive-Care Mandate. The Secretary of the Treasury, the Secretary of Labor, and the Secretary of Health and Human Services shall consider issuing amended regulations, consistent with applicable law, to address conscience-based objections to the preventive-care mandate promulgated under section 300gg-13(a)(4) of title 42, United States Code. All these small steps are good and a very encouraging development for our country. President Trump should be commended, even as we encourage him to take further action.